The 1 Megapixel HDCVI Vandal Proof Dome Camera brings you true 720p resolution video and can used with your standard RG59 coax cabling. 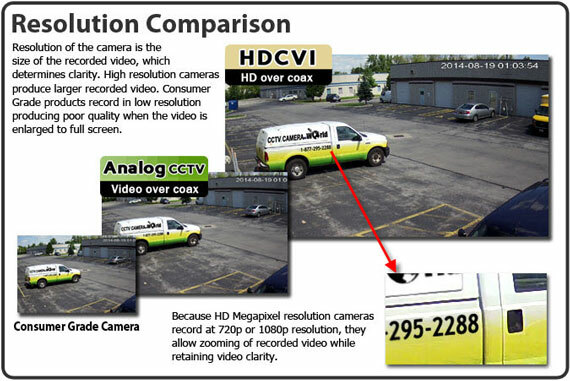 This makes for a perfect upgrade to high definition video for your cctv camera system and you will not have to worry about changing your wiring. This camera comes with a 3.6mm lens giving you an 80 degree angle of view. This is great for keeping an eye over a broad area while still being able to see detailed objects. Even better, this 1 megapixel camera has 24 Infrared LEDs so that you can maintain surveillance through the night without losing the ability to see your property up to 66ft away! The new HDCVI technology also allows you to run your cameras over a longer distance (up to 1600ft) without losing video quality. With good quality solid copper conductor coax cable, 1600ft runs are easily achieved. This camera is contained in a vandal proof, weather proof housing allowing you to install it anywhere outdoors safely. The camera's pigtail passes through the metal mounting bracket making it resistant to tampering. This is a all-around great camera to install as part of a new system or to upgrade your current system to HD video. You will not be disappointed! Can your camera record sound with this camera? This camera has no built-in microphone. It is a video surveillance camera. You would need to us a DVR with audio-input such as this and use an add-on microphone to record sound.